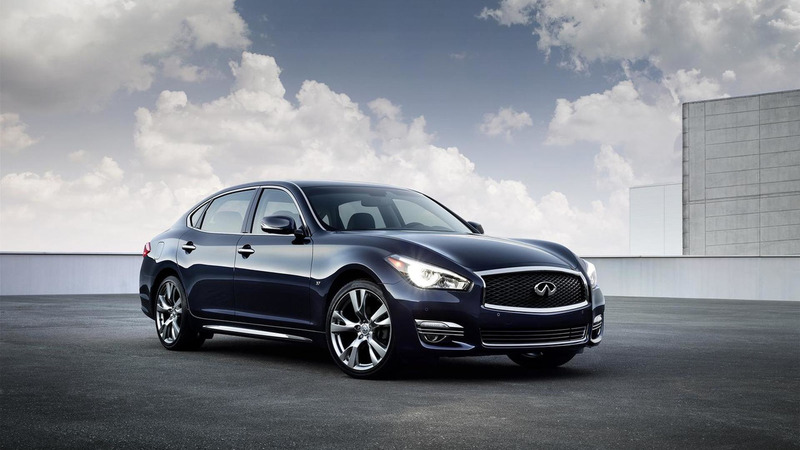 Following its debut at the New York Auto Show in April, the 2015MY Infiniti Q70 is now available on order at a starting price of 49,850 USD, without the extra 905 USD for destination & handling. The 2015 model year is introducing a facelift along with a long wheelbase variant adding 5.9 inches between the two axles, thus increasing the wheelbase from 114.2 inches to 120.1 inches. As expected, the Q70L is a tad more expensive than the regular wheelbase model as customers have to pay an extra 1,500 USD, with pricing kicking off at 51,350 USD (without destination & handling fees). 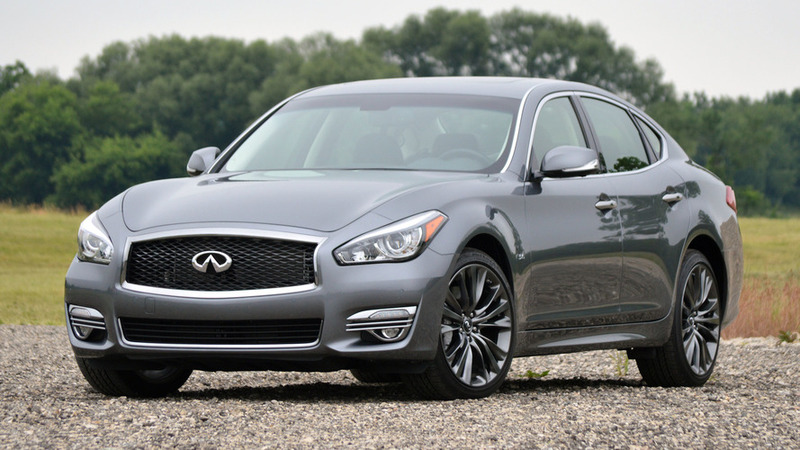 Regardless of wheelbase choice, the 2015 Infiniti Q70 is available with a 3.7-liter V6 with 330 bhp (246 kW) or a 5.6-liter V8 with 420 bhp (313 kW) in the Q70 and 416 bhp (310 kW) in the Q70L, with both models being available with a RWD or AWD setup and a seven-speed automatic transmission. The standard wheelbase Q70 can also be had with a hybrid setup in RWD guise encompassing a 3.5-liter V6 and a 50 kW electric motor providing a combined output of 360 bhp (268 kW). The conventional engine generates 258 lb-ft (349 Nm) whereas the electric motor has an instant torque of 214 lb-ft (290 Nm). 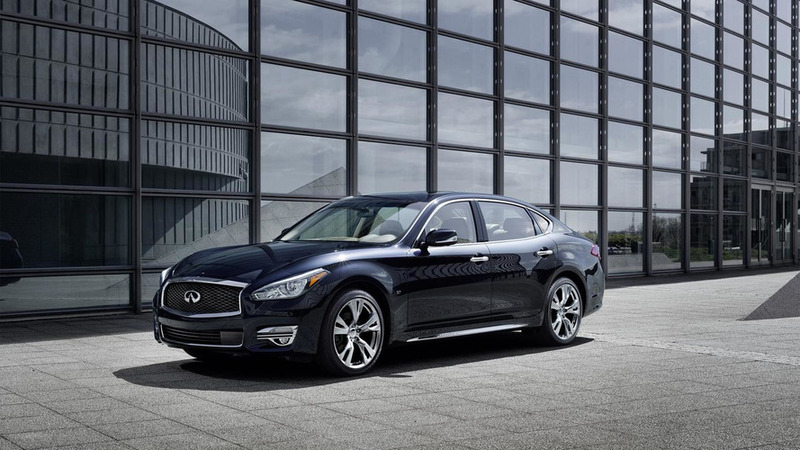 Scheduled to hit dealerships later this month, the 2015 Infiniti Q70 can be had with numerous optional packages like a sport kit bringing 20-inch wheels and different more aggressive bumpers. As a side note, yesterday Infiniti announced the facelifted Q70 will be introduced in Europe next month at the Paris Motor Show with a Mercedes-Benz-sourced 4-cylinder 2.2-liter turbodiesel engine rated at 170 PS (125 kW) and 400 Nm (295 lb-ft). Deliveries on the old continent will begin in December.